В то время как Scion уже находился в серийном производстве, "Short Brothers" построила шесть самолетов другой модификации - S.22 Scion Senior. Они могли перевозить десять пассажиров и были оснащены четырьмя двигателями Pobjoy Niagara III ДальшеMore>>> мощностью 90 л. с. Один самолет использовался компанией в качестве демонстратора для продвижения сухопутного варианта. Последний из поплавковых гидросамолетов был приобретен министерством авиации для испытаний вариантов конструкции корпусов летающих лодок. Так, например, поплавки изготавливались как масштабно уменьшенные варианты корпуса лодки Sunderland. FEW aeroplanes have combined to a greater degree economy in operation and comfort for the passengers than did the little Short Scion produced a couple of years ago. 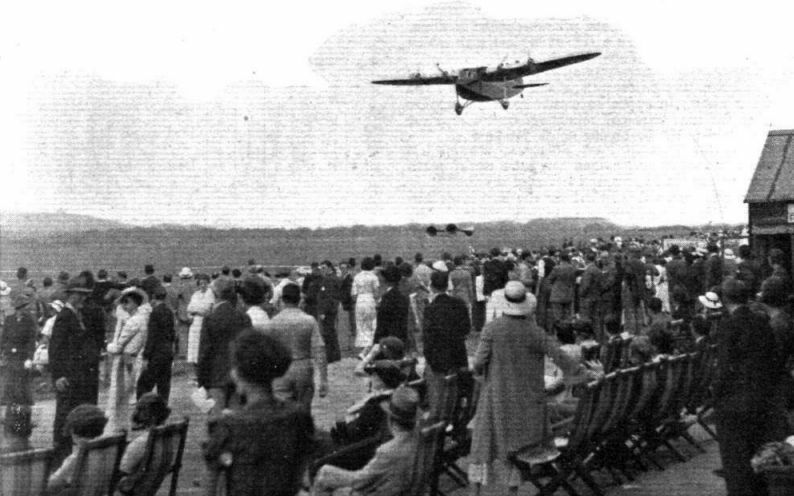 With an extremely modest power expenditure per passenger carried, that machine achieved success not only as an aeroplane but also as a seaplane. 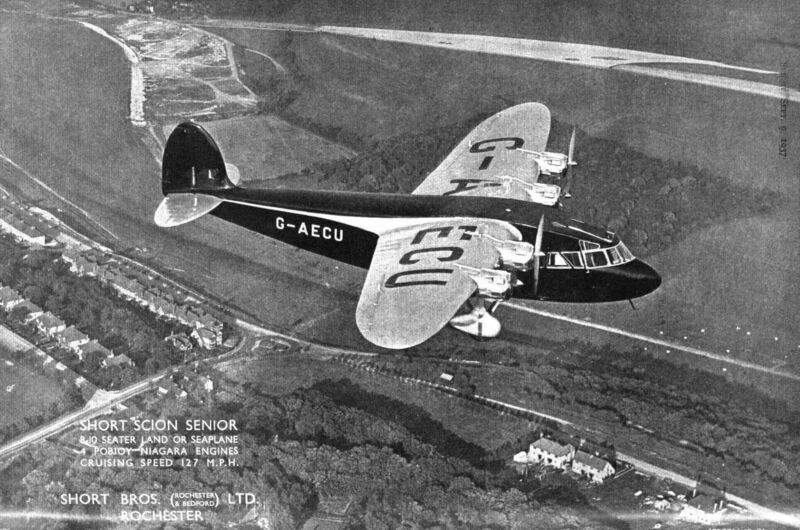 The general type having been found to be very efficient, aerodynamically as well as structurally, it was natural that Short Brothers, of Rochester, should produce a slightly larger version. Equally natural was the choice, for the new type, of four engines instead of two. The original Scion was just able to fly level with one of its two engines out of action, but obviously there could be little reserve of power. 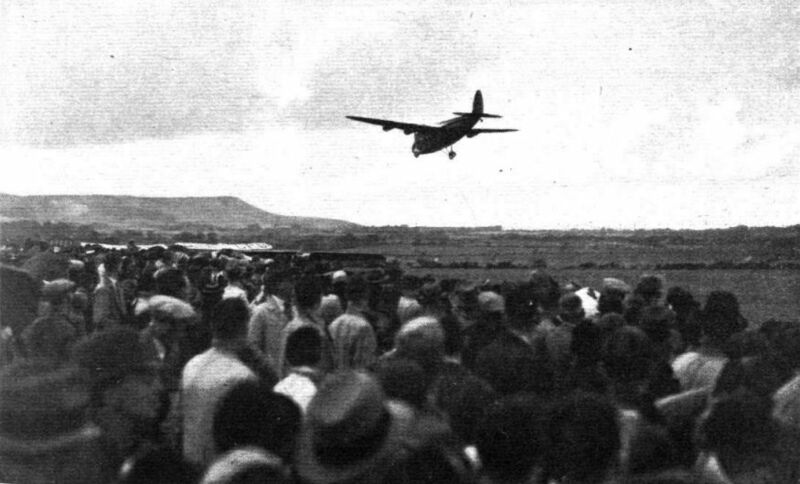 In the latest type, known as the Scion Senior, the aeroplane version is just able to keep in the air at low height with two of the four engines stopped. With one engine out of action the machine has a service ceiling of 6,500ft. (as a landplane) and 5,500ft. 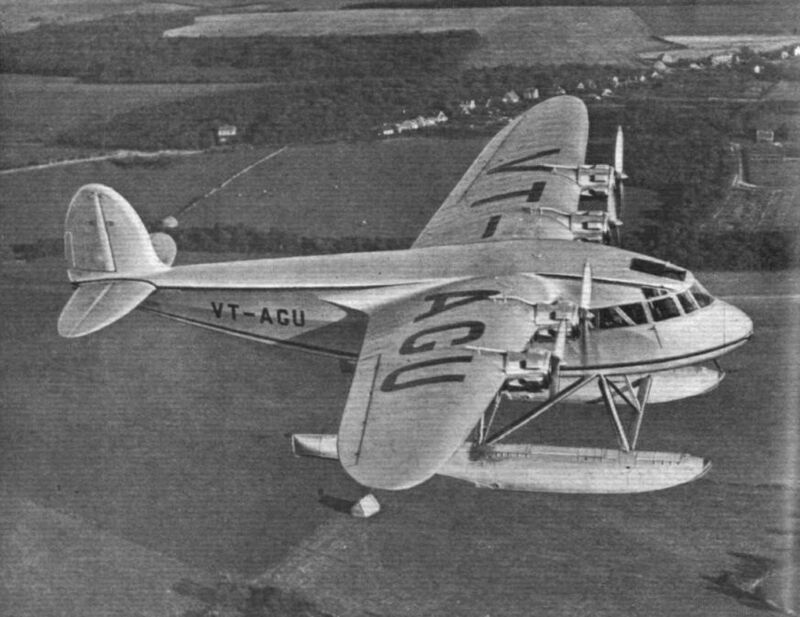 as a seaplane. Obviously, therefore, the risk of a hurried forced landing should be very remote. Seating accommodation can, of course, be varied to suit the needs of individual purchasers. Normally the cabin will be arranged for ten passengers and one pilot. As the four Pobjoy Niagara engines develop a maximum of 90 b.h.p. each, the power expenditure per paying passenger is but 36 b.h.p., which must be regarded as remarkably low. Yet the machine has a very good performance both in speed and climb, the former being 140 m.p.h. maximum for the landplane and 134 m.p.h. 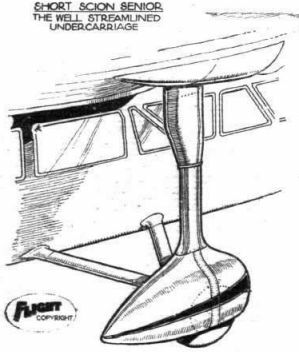 for the seaplane. The cruising speeds are approximately 125 m.p.h. and 120 m.p.h. respectively. These figures point to very efficient aerodynamic design. The mileages per gallon are 6 3/4 and 6 1/2 respectively, or 67 and 65 passenger miles per gallon. It should not be difficult to find uses for such a machine on unsubsidised work. A feature of the original Scion was its quietness. The new machine, with four engines instead of two, does not appear to be any worse off in the matter of noise, and this should be another strong point in its favour. The first Scion Senior has just been put through its flying tests and will shortly be delivered to the purchasers, the Irrawaddy Flotilla Company. For use in the East this machine has rather fewer seats than the standard, and wickerwork seats are adopted for coolness. Fundamentally, the Scion Senior may be said to be the logical development of the earlier twin-engined machine, with which it shares its main structural and aerodynamic features. It is a high-wing cantilever monoplane of metal construction, with the four Pobjoy Niagara engines mounted abreast on the leading edge of the wing, into which they are neatly faired. 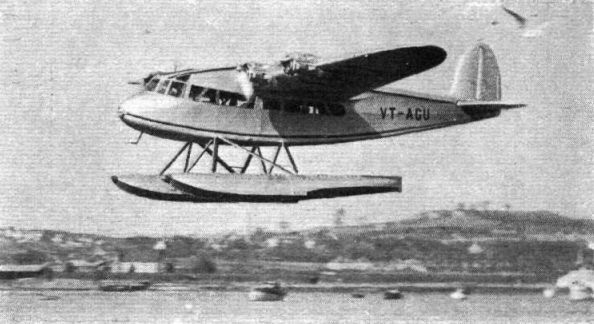 The first machine of the type has passed its first flying tests as a seaplane, but the next to come along will probably have a wheel undercarriage. 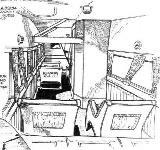 In our general arrangement drawings both types of undercarriage are shown, and it will be seen that both fit into the design very well. 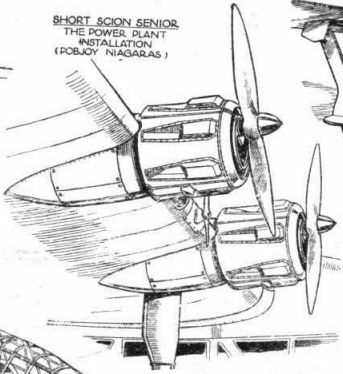 Owing to the fact that the fuselage of the Scion Senior is a good deal longer than that of the twin-engined Scion, while the depth is very little greater, the proportions are better and the result is an improvement in appearance, as the illustrations show. Well-tried methods of construction have been followed in the structure of the Scion Senior. The fuselage has a primary structure of welded steel tubes, while the wing structure makes use of duralumin in extruded and tubular form. The covering is fabric doped with Titanine. The main spar has flanges of extruded duralumin, of cruciform section. This lends itself readily to the attachment of the tubular bracing members, the fork ends of which are simply bolted to the flanges of the cruciform sections. The structure of the original Scion was of similar type, and was found to be economical in weight of material, remarkably stiff in torsion, and entirely free from troubles with flutter. 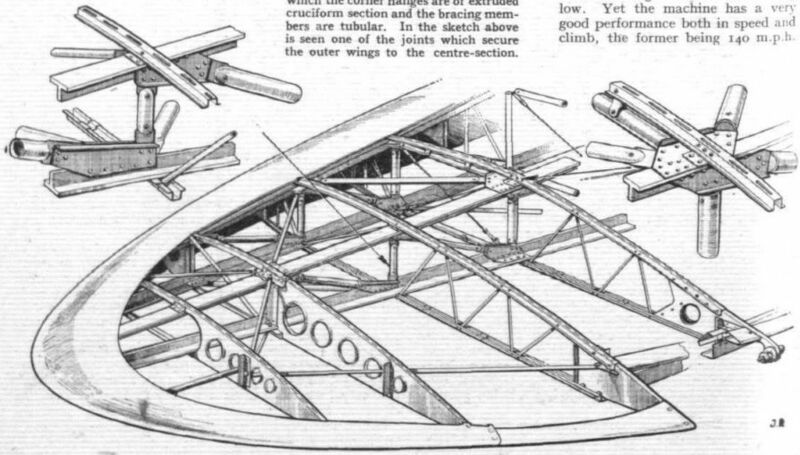 The wing ribs, as well as the ailerons and tail unit, are of normal Short construction as employed in flying boats for a great number of years. The cabin, which has a volume of 382 cu. ft., measures 17ft. in length, has an average width of 4ft. 6in., and a mean height of 5ft. The windows are placed relatively low on the sides, and as the wing is above the fuselage the view from the cabin is very good, the window height being such as to facilitate looking down on the ground or sea without craning. Control surfaces are of orthodox design, the ailerons being of the Frise type, with set-back hinges and aerodynamic balance. They are also mass-balanced. 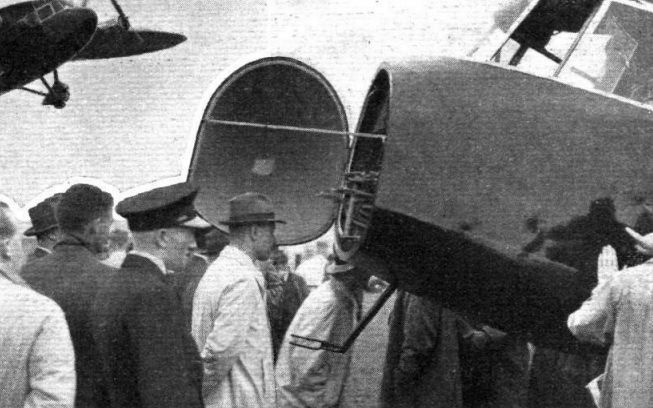 The tailplane is fixed, and the elevators are provided with trimming "tabs," while a similar "tab" is used on the rudder. In the pilot's cockpit there is a very complete set of instruments (Smith's), including air-speed indicator, altimeter, fore-and-aft level, turn and bank indicator, compass ("Husun" Mark IIIa), oil-pressure gauges, and eight-day clock. The four rev indicators are of the Weston electric type. A very complete electrical installation is carried, including generator, battery, navigation lights, landing headlight in the nose of the fuselage, cabin lighting, and direct-cranking electric engine starters. Radio can be fitted, but is not included in the weights given. Sixty gallons of petrol are carried in two tanks in the wing roots, giving a cruising range of 400 miles for the seaplane and 420 miles for the landplane, in both cases cruising at 3,100 r.p.m. and at cruising speeds of 115 m.p.h. and 12-2 m.p.h. respectively. When cruising at 3,200 r.p.m. the respective cruising speeds are 121 m.p.h. and 127 m.p.h., but the ranges are then slightly reduced. The fuel consumption of the four engines at 3,100 r.p.m. is taken as 18 gallons per hour. 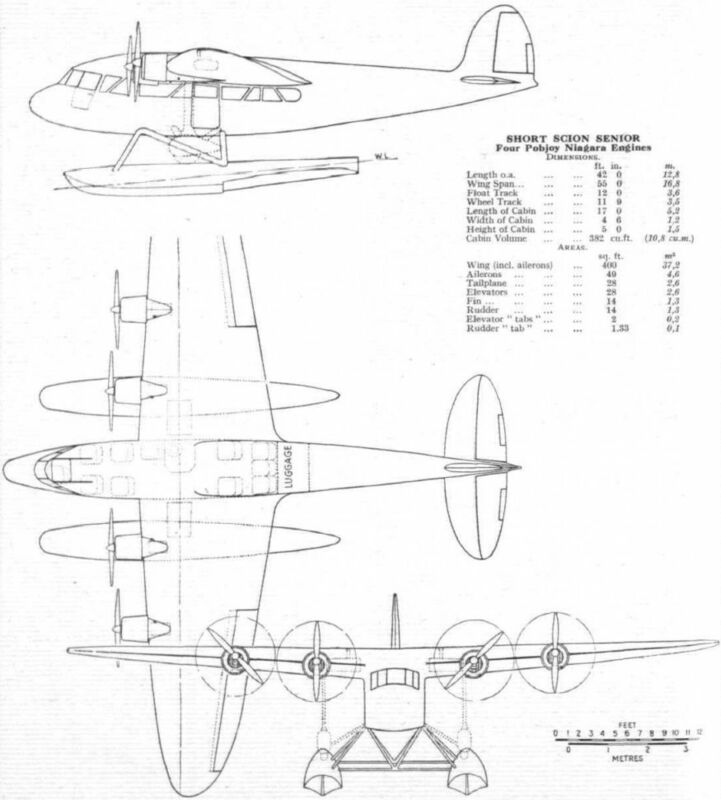 The payload of the seaplane, not counting the weight of fuel and oil for 400 miles, nor the weight of the pilot, is approximately 1,170 lb., and for the landplane the payload is 1,500 lb. The gross weight of the machine is in both cases 5,750 lb., and the tare weight of the seaplane, fully equipped but without radio, is 3,886 lb., while the landplane weighs 3,546 lb. The total disposable loads are 1,864 lb. and 2,204 respectively. In other words, the seaplane carries as disposable load 48 per cent, of its own weight and the landplane 62 per cent. For a machine of this type these figures are above the average. SHORT BROTHERS' LATEST: The Scion Senior carries up to ten passengers at a maximum speed of 134 m.p.h. although its four Pobjoy Niagara engines develop a total of only 360 b.h.p. The next machine to be built will have a wheel undercarriage. OUTSTANDING CIVIL TYPE: This small commercial type, the Short Scion Senior with 90 h.p. Pobjoy Niagara engines, was produced in 1935. 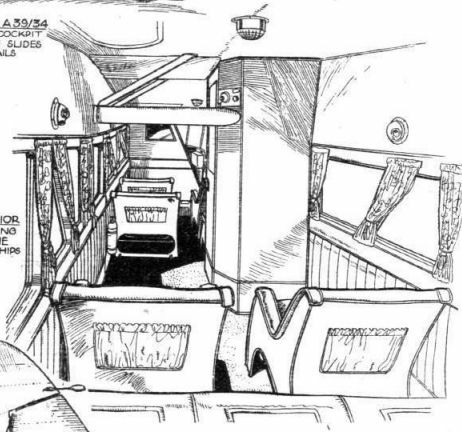 It has seating accommodation for ten passengers. With four Pobjoy Niagara engines of 90 h.p. each the Short Scion Senior carries up to ten passengers. The machine is available both as a landplane and as a seaplane. The Short Scion Senior at her moorings in the Medway, off the works of Short Brothers. 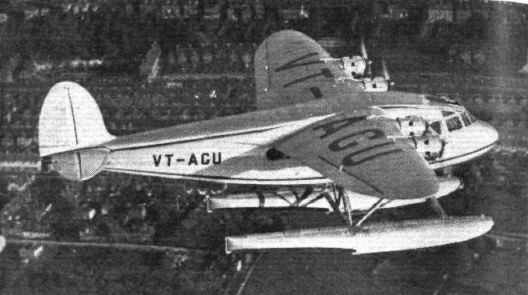 The seaplane version of the unique Short Scion Senior has a maximum speed of 135 m.p.h. ON THE IRRAWADDY. 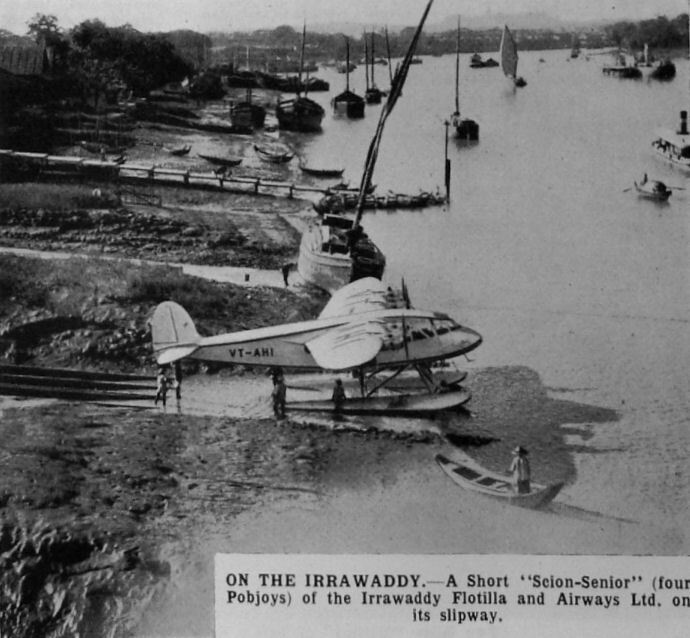 - A Short "Scion Senior" (four Pobjoys) of the Irrawaddy Flotilla and Airways Ltd. on its slipway. FOR THE IRRAWADDY FLOTILLA COMPANY: The first of the new Short Scion Seniors (four Pobjoy Niagaras) on the slipway at Rochester. The machine bears Australian registration letters. Clean aerodynamic design endows the Short Scion Senior with a good performance in spite of the relatively low power (four Pobjoy Niagara engines of 90 h.p. each). The top centre photograph on this page affords an interesting comparison between ancient and modern transport on the Medway, at Rochester. The shapely nose of the first Short Scion Senior. This machine has been sold to the Irrawaddy Flotilla Company for work in the east. 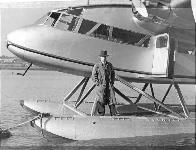 Standing on one of the floats is Mr. J. Lankester Parker, Short's chief test pilot. 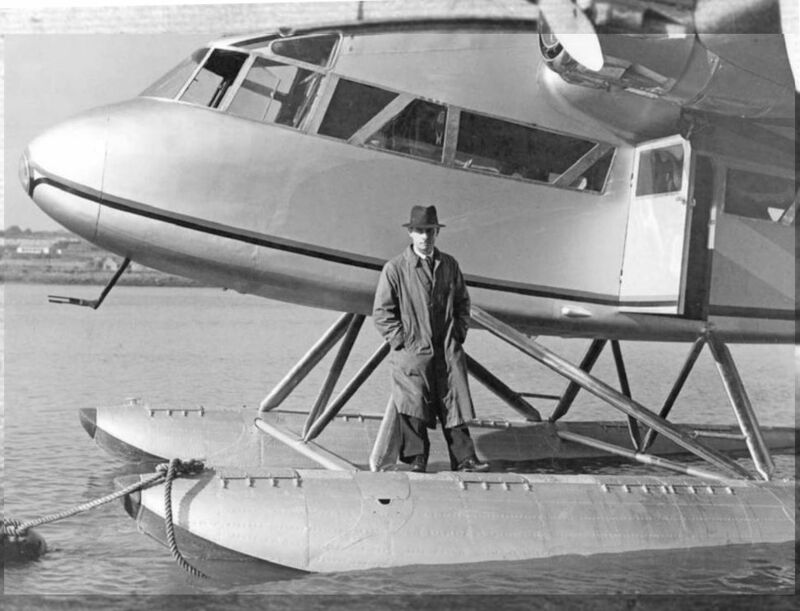 A splendid photograph of John Lankester Parker standing on the port float of the first Short Scion Senior, VT-AGU, moored in the Medway before its delivery to the Irrawaddy Flotilla Co in Rangoon in January 1936. 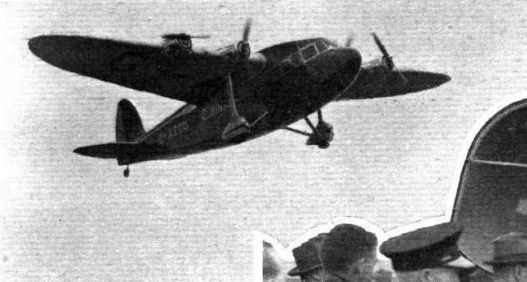 Lankester Parker flew every Short prototype on its maiden flight until his retirement from test flying in 1945. 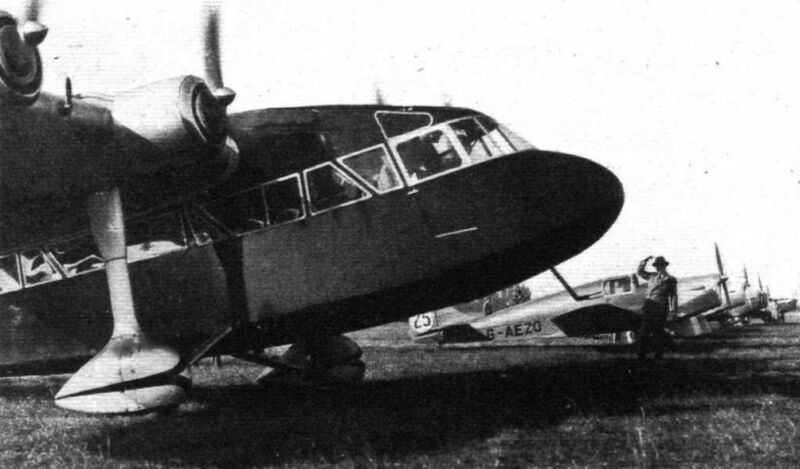 The Short Scion Senior (four Pobjoy Niagaras) is shown as a landplane. A Triton among the minnows: Piper's Short Scion Senior ready to leave the line on Friday. The next machine is Brig.-Gen. Lewin's Miles Whitney Straight, which finished second. SHORT SCION SENIOR. 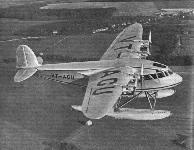 8-10 SEATER LAND OR SEAPLANE. 4 POBJOY NIAGARA ENGINES. CRUISING SPEED 127 M.P.H. Mr. Piper in the Short Scion Senior entertains the Wilmington crowd. 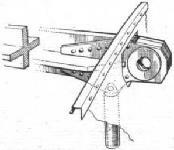 Details of the wing construction: The spar is in the form of a girder "box," in which the corner flanges are of extruded cruciform section and the bracing members are tubular. 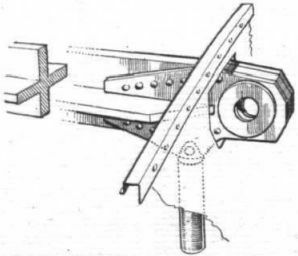 One of the joints which secure the outer wings to the centre-section. 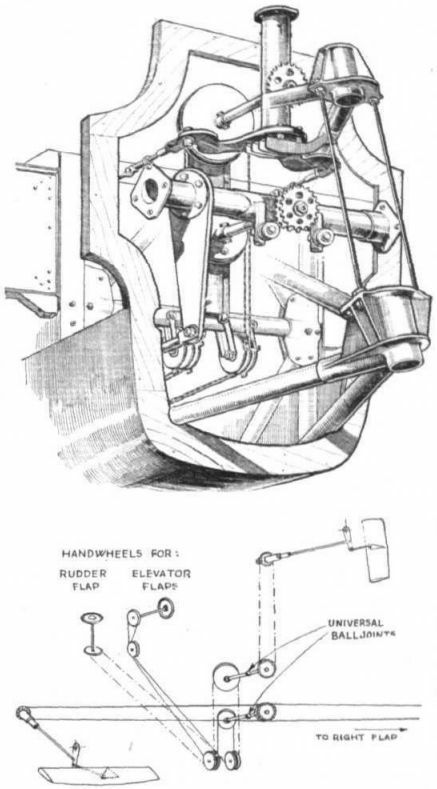 The grouping, in the stern, of the elevator and rudder control leads is shown in the upper drawing. The sprockets and small pulleys are for the rudder and elevator "tab" controls. The lower diagram shows how these control leads are arranged.